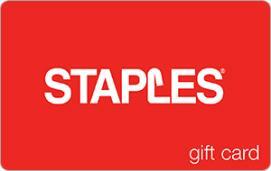 Earn 2 SB per $ when you buy Staples gift cards at MyGiftCardsPlus, powered by Swagbucks. Bring some easy to your day with a Staples® gift card. It’s truly the convenient, flexible choice. At Staples, you’ll get a great selection of everything you need, from technology items to your favorite everyday office essentials. Plus, you can take advantage of the Low Price Guarantee – Find a lower price and Staples will match it. To find a store near you, go to staples-locator.com or call 1-800-STAPLES. Swagbucks is a program provided by Prodege. Staples is neither a sponsor of Swagbucks nor an affiliate of Swagbucks. See Staples Gift Card for complete terms and conditions of use. Valid only if purchased from a Staples U.S. retail store, at staples.com or from an authorized reseller or distributor, or received from an authorized distributor. No more than five cards may be used for any single purchase.